Since July in the US is about the 4th of July celebration, I will start with this day. How we celebrated this holiday this year is significant.. Mr Sweetie got out of the hospital just less than a month ago. His health scare was an eye opener for us. 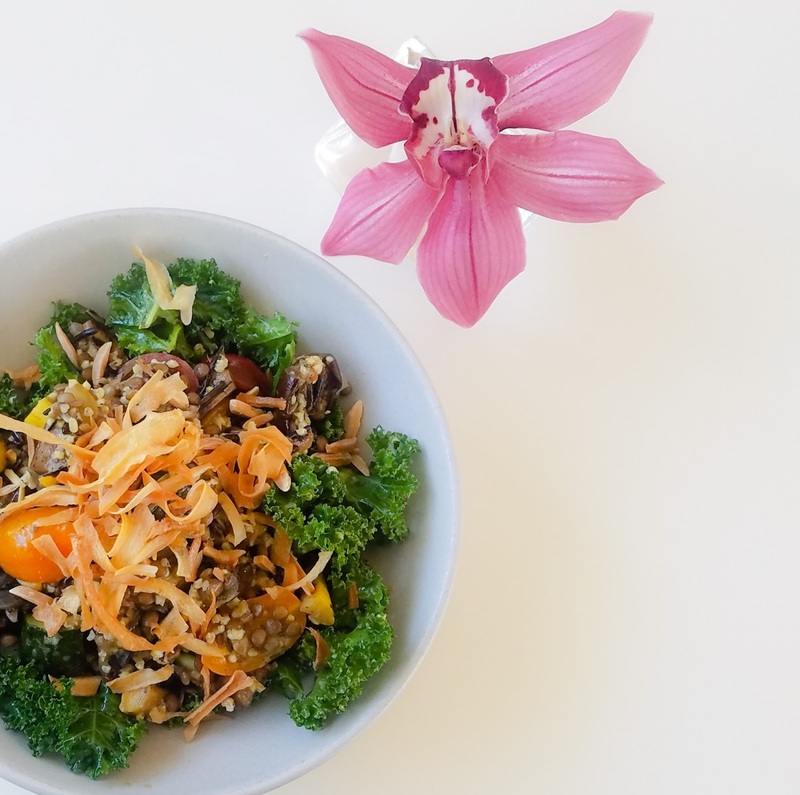 We have made a commitment to pursue a more balanced and healthy lifestyle. The change is reflected in what we chose to eat this holiday. In the previous years, I would go all out with a rack of pork ribs, appetizers, wine and dessert as you can see on last year's 4th of July. This year, I made us a burger each. They were very good burgers, though. I used grass-fed and organic ground beef. We both enjoyed it very much and felt good for not overly indulging. This is also the first year where we did not light fireworks as our neighbors did not. Mr Sweetie bought fireworks and excited to light them. We are guessing that it was because of the wild fires and poor air quality. We wanted to be respectful and it was okay that we did not light the fireworks. It was an indulgent day though of resting and bingeing on movies including Kingsman 2. The highlight of July for me was when my parents finally went back home to the Philippines. They were only planning to stay from December to February. They came to the US to celebrate their 50th anniversary with the family. They ended up staying for 7 months mostly because my siblings and I did not want them to go back home just yet, and my dad's hospitalizations as well. It was the highlight because it changed everything for me and my family. Our lives and days revolved around my parents being here. Although caring for our parents in their old age posed some challenges, we had so much fun as a family. Our family is small here in the US. My siblings, sis-in-law, Mr Sweetie, nephews, niece and I were closer because of my parents' visit. Every Sunday was a party whether going out to eat after church or having a feast during Sunday lunch. July 8 -- My parents said that they were getting tired of Asian food so I took them to Red Robin for American food. 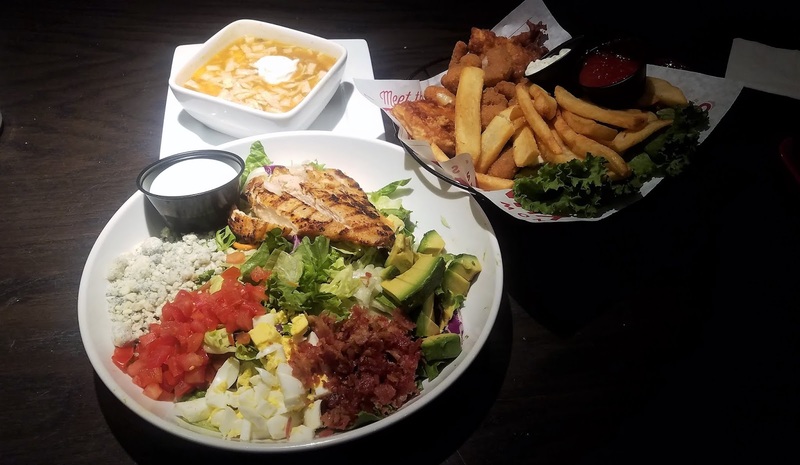 On the menu were fish and chips, cobb salad, tortilla soup and eat-all-you-can fries. The verdict? They did not like it and wished they had Japanese food again! Ha! Ha! My mom and dad are funny! July 15 - Thank God for this little mom and pop Japanese restaurant. No line at lunch time on Sundays and decent Japanese food. This has been our default whenever my parents get the cravings for tempura and sashimi. We came here again and this time my 14 year old nephew, Matthew, joined us. 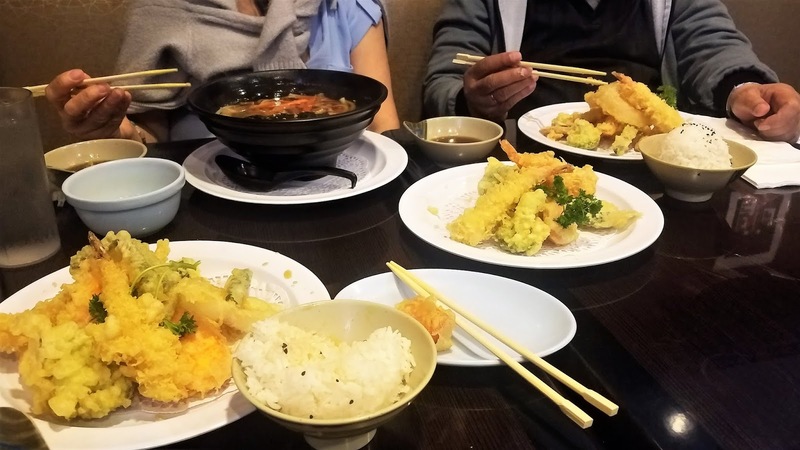 Always hits the spot for udon and fried shrimp and veggie tempura. July 22 -- This was the last Sunday lunch with my mom and dad before they flew back to the Philippines the following Friday. I am glad that this last lunch was a good one. To think that we got here by mistake. GPS sent us here when we were trying to go to a different place. This is a Korean-Japanese restaurant. My parents enjoyed it and it was more special because my 14 year old nephew, Gabriel, joined us as well. Then it was Costco and shopping at Asian market afterwards. July 1 -- My family hosted a Kamayan. Tagalog for "by hand," kamayan is the traditional Filipino way of eating. 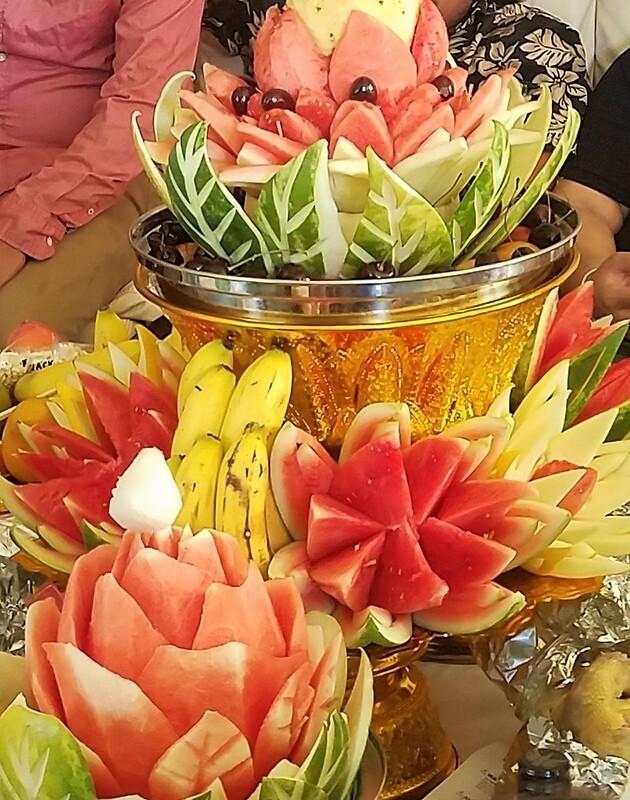 It also means communal-style Filipino feast, composed of colorful arrays of food that are usually served on banana leaves and eaten using hands only. This was exactly what we had. I will post a full, separate post as it was a sight to behold. It was also a memorable day of feast with my mom and dad, my siblings, family and friends. My siblings and I hosted it to welcome Mr Sweetie after his hospitalizations and to celebrate Father's Day. I went to SFMOMA twice this month. Nice membership perk. 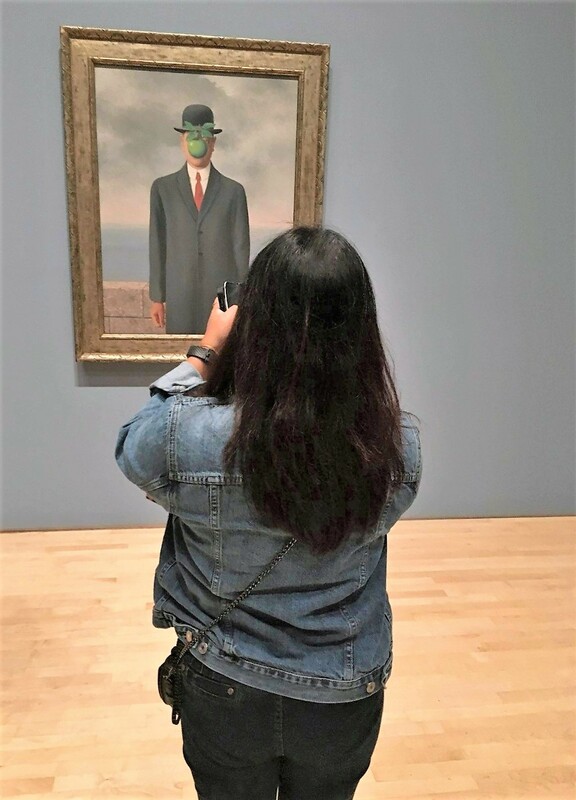 First visit was with BFF to see Magritte. We both agree that this has been our favorite artist and exhibit so far since we started going regularly over a year ago. The second visit was with my friend, Jax. We also had a lovely lunch at the museum cafe. It was nice to catch up and got to thank her for the soup and lasagna that she sent while Mr Sweetie was in the hospital. I call her my Laotian sister because we go way back. Mr Sweetie and I attended her baby's 1st birthday party. It was a lovely summer afternoon hanging out in the backyard and spending a little bit of time with her. I managed to sneak in a couple of "me time" moments despite not having much time to do so. Took the day off for eye exam and fresh supply of contact lens. How I miss contacts! I have been wearing glasses for months since I had no time to see an eye doctor. 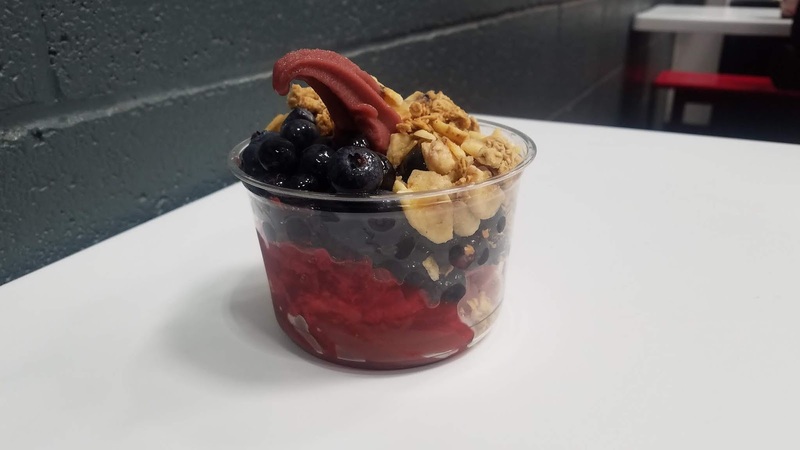 First taste of acai bowl after my eye exam. And to be able to eat it slowly and savor it was bliss! July 7: Dinner at Azit Korean. My review of the restaurant here. July 14: Attended baby's 1st birthday. We went to Nations Burger afterwards where Mr Sweetie got burger and fries while I only got a slice of egg pie. We just ate at our friends' party but the man can eat! July 28: Impromptu date night at the airport. Mr Sweetie and I met at the airport. I was coming from work and we had an hour to spare before my parents, brother and sis in law arrived. 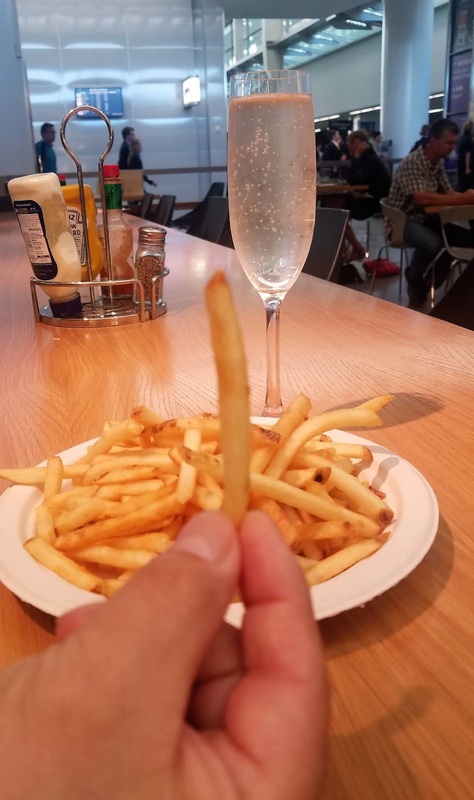 I enjoyed a chilled glass of prosecco and fries. It was actually a very nice Fridate. I always find airports to be romantic! Ha! Ha! See the second photo on this post. July 29: Pizza and movie at home. We decided to just stay home and just ordered pizza delivery since we already went out the night before at the airport. We needed the rest and it was a evening of pizza and movie "Truth Or Dare." As always, I like to end my post with a picture of home cooked dish by my family. This one is special as this has been one of the last dishes that my mom cooked before they left for Manila. Per my brother's request, my mom cooked her famous dish, Kare-Kare, which is oxtail stew in peanut sauce. My mom is known for this dish. She saved some for me and my siblings and I pretty much licked our bowls clean! Will definitely miss mom and her cooking! Wow! I did it! I am only a month late in my posting of this monthly series! I have so many things to be thankful for this month. I am thankful for the many opportunities to spend time with my mom and dad during Sunday lunches and shopping after church. I am most grateful for worshiping with my family on Sundays, and spending my Sunday afternoon with them. The times I spent with my nephews and niece who are growing up way too soon. I am grateful for the supportive girlfriends. My girlfriends are the family that I chose for myself. And every moment I spend with Mr Sweetie is precious. I am blessed to have a partner who is also a fun friend to hangout with. And thank the Lord for the blessing of sight. My prescription is pretty much the same as two years ago which is a great thing because sadly, I am blind as a bat without my glasses! Thank you, July, for a lovely month of memories! PS I also wrote about these on my Weekly Joys series. They can all be found here.